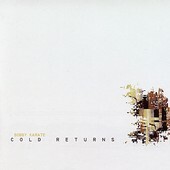 Late-night, drone-y electronica experiments, Bobby Karate's Cold Returns is a cold, harsh, mellow record, a detached, reserved exploration through his own soul, turning away anytime it gets close to anything personal. But, perplexing enough to make you want to lay back and absorb it all, as you rest there lifeless, intoxicated by the weird, quirky sounds. Monotone in its presentation and conservative in its approach, it neither commands attention nor warrants it, but ends up getting it after all. It's a trying record, one you'll be scratching your head trying to figure out. I'll give it a C.